Solar photovoltaic cells and panels have a life time of 30 years; 50 years would be extraordinary; thus every square meter of PV surface area would have to be replaced in less than 50 years. 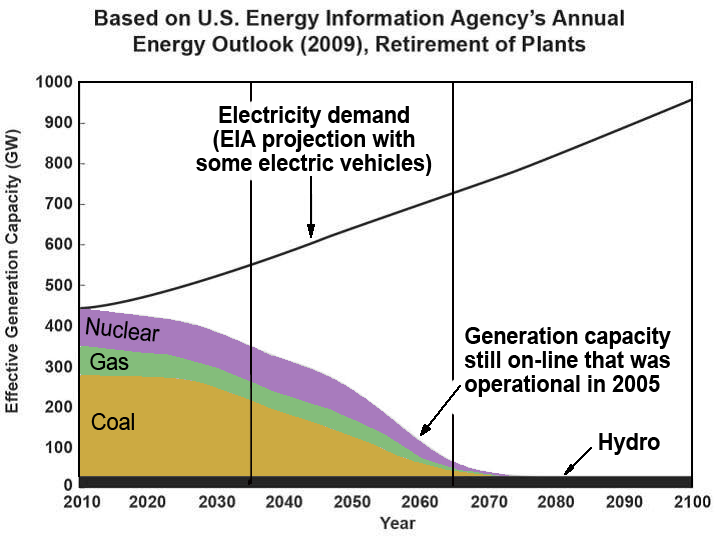 Over the next 50 years, utility companies in the United States must replace approximately 440 Gigawatts (GW) of baseload generation capacity to provide electricity nationwide. Significant electrification of the transportation segment through electric cars and trucks can potentially quadruple the amount of needed power. This paper explores the system requirements to replace this generation capacity with a photovoltaic only generation scheme. Topics include the definition of peak power demand, time of use issues, reserve power requirements, storage to provide power when there is no sunlight, and the various engineering challenges associated with managing a large area synchronous AC power grid. This analysis considers the factors involved in dimensioning solar power generating plants. To illustrate the issues involved the example considers the case for supplying the entire electric power needs of the USA from solar energy without the use of fossil fuel, nuclear or other back up. To simplify the calculations, the example considers a single very large hypothetical solar power installation providing all the country”s power although in practice, generation would be dispersed in a network of smaller installations throughout the country each one closer to the point of need. Depending on the location of the solar arrays, some modifications or additions to the electricity grid distribution network may be required but these have been ignored for the purposes of this study. In reality, such a future solar only electricity supply would most likely be generated by a mix of energy sources including several large T&D grid connected solar power installations as well as many domestic installations. The example used for this study is a conventional solar power plant consisting of a large bank of solar panels, each made up from an array of individual photovoltaic (PV) cells, feeding the electricity grid network during the day. and charging a bank of batteries which will provide the power during the hours of darkness. The example shown below is a grid connected PV system (batteries not included) which is inactive at night when power is provided by traditional “spinning reserve” of steam driven turbines which make up part of the grid system. An off-grid system like the one considered here also requires a large battery bank to store energy during the day in order to maintain the supply during the night. The calculations are based on current demand only and do not include future growth. The drive towards the greater use of electric vehicles will increase this demand significantly over and above normal growth and, since most people recharge their batteries at night when the Sun is not shining, this will require a major restructuring of both the generation and storage capacities of the national grid to cope with the increased demand and its changed profile. For convenience it is often useful to convert this energy demand into the equivalent average rate of power generation or consumption. This measure assumes constant power generation 24 hours a day, 365 days per year. The power delivered is given by the energy consumed divided by the time, in this case, 1 year or 8760 hours. Thus the estimates given for average power consumed range from 415 to 535 GigaWatts (GW). For the purposes of this example an annual energy demand of 3854 TWh corresponding to a power usage of 440 GWaverage generation is assumed. But life is not so simple. The demand is not constant, but varies during the day and also suffers seasonal variations as well as regional variations. There are many published demand profiles reflecting these variations. The profile shown below, compiled by U.C. Berkley, is reasonably representative and offers the possibility of simpler assumptions than some other profiles. It shows that the demand during 12 daylight hours is approximately double the demand during the 12 hours of darkness. This means that 2/3 of the energy is consumed during the day and 1/3 at night. Assuming that the demand is to be exclusively satisfied by solar power alone, the night time demand would have to be generated by the solar panels during the day. So with an average (continuous) power demand of 440GW, the daily energy demand is 24 X 440 = 10,560 GWH. But all of this energy will have to be captured during the 12 hours of sunlight, that is, in half the time, so that the solar power generation capacity must be 880 GW. Of the 10,560 GWH of energy produced during the day, two thirds (7,040 GWH) will be used directly by consumers and one third (3,520 GWH) will be used to charge the battery for subsequent discharge to satisfy the consumers during the night. The corresponding power demand will be 586.7GW during the day and 293.3 GWduring the night. It is assumed that the daily demand profile matches the timing of the hours of sunlight, but this is not necessarily the case. However it does not significantly affect the conclusions of this study. In practice, the solar energy captured would be more in the summer and less in the winter so that more solar panels and larger batteries would be needed in the winter and fewer in the summer. An allowance can be made for this but for the purposes of this example, these variations have been ignored. From the above we can conclude that solar generating power capability of 880 GWand a battery energy capacity of 3,520 GWH will be required to satisfy the demand. But public utilities always need a plant margin to cover, maintenance, breakdowns, unplanned peak demands and other emergencies and this is typically 20%. Also there will be a 10% efficiency loss in the inverters necessary to convert the DC solar energy generated by the PV arrays to the AC supply connected to the distribution grid. In addition there will be a further charge-discharge round trip Coulombic efficiency loss in the batteries of about 5%. To be generous, letâs say an extra 25% of energy must be generated to cover these two efficiency losses as well as the plant margin. Thus the generating power will need to be at least 1,100 GWor 1.1 TW and the battery capacity will need to be 4,400 GWH to allow for the efficiency losses and the plant margin. The actual amount of solar energy impinging on the solar panel depends on several factors. The solar energy reaching the Earthâs atmosphere, known as the irradiance, is 1,367 W/m2 normal to the Sunâs rays. By the time it reaches the ground after absorption by the atmosphere it is reduced to 1,000 W/m2 normal to the Sunâs rays. This corresponds to the energy impinging on a flat plate on the ground when the Sun is directly overhead. Then there is no Sun at all during the night. Finally the angle to the Sun, as well as the number of daylight hours, decreases (In the northern hemisphere) during the winter months as the Earth orbits the Sun. Taking all of these factors into account, the average of the time varying solar energy received on the ground is called the insolation and figures have been published for the actual insolation at various geographic locations by several sources. NREL is one such source which publishes a range of charts showing the daily average solar power received during each month of the year, plus yearly averages, for different solar array types and configurations at various locations in the USA. The chart below is typical and has been used, with others in the series, in the calculations which follow. For the purposes of this study, the location chosen for the solar plant is somewhere in the South West, the sunniest part of the country, since this will require the smallest solar array. For a tilted flat plate array, as specified below, the chart shows that the average solar energy intercepted throughout the year by the array is around 6 kWh/m2/day in the South West. If the plant were to be located in the colder northern states, the energy intercepted would drop by a third to around 4 kWh/m2/day so that the solar array would have to be about 50% larger to capture the same amount of energy. Other charts in this series show how the insolation decreases during winter months and increases during the summer. Several configurations of solar panels are available. The simplest and least expensive solar array is constructed from a series of fixed flat plate collectors all facing south and tilted towards the Sun at an angle corresponding to the latitude of the site. The efficiency can be improved by 30% or more by means of tracking systems which ensure that the solar panel is always pointing directly at the Sun. Two axis systems track the apparent changing azimuth and elevation of the Sun as the Earth rotates during the day and continues its year long journey around the Sun. This option is quite complicated and very expensive. See more about Solar Tracking. From the NREL charts, the annual average insolation (solar energy received) in the South West of the USA is between 5 and 6 kWh/m2/day for a fixed array tilted towards the Sun and 7 to 8 kWh/m2/day for steerable two axis solar panels able to track the Sun across the sky, maintaining the Sunâs rays as close to normal as possible to the surface of the array. Let us assume 6 kWh/m2/day for a fixed array and 8 kWh/m2/day for a two axis tracking array. The current generation of mass produced commercial PV cells for converting solar energy into electrical energy have a conversion efficiency of around 15%. This means that the above fixed array can generate the equivalent of a 24 hour average continuous power output of (6Ã·24) X 0.15 kW/m2 during each hour or 37.5 Watts/m2. Similarly a two axis tracking array can generate an average of 50 Watts/m2 during every hour. During hot sunny days the PV cell output will increase due to the increased solar radiation, but at the same time the cell temperature will also rise causing the cell output power to fall due to the decrease in the conversion efficiency. See (Solar Cell Operating Characteristics).The PV cell output power typically reduces by about 0.5% for every degree Celsius increase in PV cell temperature. The precise output power achieved from the cells depends on the conditions, but to optimize the power output, water cooling is often employed to keep the cell temperature as low as possible. The calculations in this example assume STC (Standard Test Conditions) PV cell ratings, that is a cell temperature of 25 Â°C without external cooling. Local conditions may necessitate cooling to get the best out of the solar arrays and this would increase the cost and complexity of the installation. Because of the mismatch during charging between the voltage generated by the PV array and the voltage of the battery being used to store the charge there is a potential energy loss which can be as high as 10% of the captured energy. This loss can normally be reduced to about 1% by using Maximum Power Point Tracking, an electronic technique designed for this purpose. 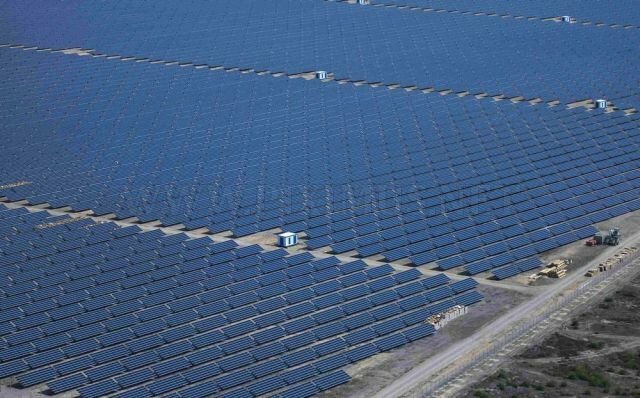 To generate the system requirements of 1,100 GW, a fixed solar array would have to have an area of 1,100,000,000,000/37.5 sq meters, made up from 29.333 billion, 1 meter square panels, covering an area of 29,333 km2 or a square with sides of 171.3 km long. This is about the size of Belgium and 50% bigger than Israel, just for the silicon PV cells. Similarly, using the more expensive tracking array could reduce this area to 22,000 km2 or a square with sides of 148.3 km. Note that If 1 square metre PV panels were manufactured at the rate of 1 per second, it would take 930 years to manufacture 29.3 billion panels. It takes energy to make PV panels, especially the highly efficient, old-school crystalline silicon kind. Even just creating the silicon crystals requires heating rock or sand to around 1650 Â°C (3,000 Â°F), and that”s not counting the creation of the electronics that connect the silicon wafers to the grid, and the mounting hardware that holds the whole thing together. And then there”s the energy used to ship the panels and install them. A study by researchers from the Netherlands and the USA (Fthenakis, Kim and Alsema, 2008), which analyses PV module production processes based on data from 2004-2006 finds that it takes 250kWh of electricity to produce 1m2 of crystalline silicon PV panel. The solar panels considered above typically produce around 300kWh electricity per year, so it will take almost a year to “pay back” the energy cost of the panel. The total area covered by the solar array will significantly larger than the area of the panels to allow for installation, maintenance access and periodic cleaning. The space required for the batteries is in addition to this. The example above assumes that the entire solar generating capacity is located in a region with the most advantageous solar conditions. What if the plant were to be located in the cloudier and chillier North East? From the NREL solar maps, we can see that the average daily solar radiation would be reduced from 6 kWh/m2/day to 4 kWh/m2/day. Thus the average electrical power produced by the PV cells with the same efficiency of 15% will reduce from 37.5 W/m2 to 25 W/m2 and the number of one square meter solar panels required to produce the same electric power would consequently increase by 50% to 44 billion covering an area of 44,000 square kilometers or a square with sides of 210 km. Bigger than Denmark, the Netherlands or Switzerland. On the other hand, because of the higher PV cell temperatures experienced in the South West, installations would probably require local cooling systems to optimize the power output, whereas installations in the North East would benefit since they could get by without PV cell cooling. Cooling requires additional power to pump and chill water. The required battery capacity would be largely unaffected by the location, but the cooling requirements could change. In the warmer southern regions forced cooling will most likely be required, but in the milder northern conditions we could expect this requirement to be reduced though probably not eliminated. The battery is no less complicated. Thomas Edison is reputed to have said “When people get into the battery business they automatically become liars”. That was before he got into the battery business himself. It may not be true today but there”s plenty of room for misunderstanding the battery specifications, particularly with modern Lithium batteries. Let”s just look at the capacity here. The battery”s capacity is the amount of energy it can hold. Unfortunately this is not all usable energy since it is not advisable to keep the battery at its fully charged level with a 100% state of charge, nor should a Lithium battery be discharged to below 2 Volts. The most stressful operating state of a battery is when it is fully charged. Lithium batteries in particular are at risk of damage from even slight overcharging and Battery Management Systems (BMS) must provide precise control of the charging process to avoid this. Lithium batteries also suffer damage at low states of charge (SOC) because the active chemicals in the battery undergo irreversible changes at low voltage affecting both the battery”s life and its safety. See Lithium Battery Failures and SOC. Thus a Lithium battery should operate between about 20% and 95% state of charge so that its useful capacity will be around 75% of its theoretical or installed “nameplate” capacity. In the example that follows, the capacity is considered to be the usable capacity. Battery manufacturers however usually specify the nameplate battery capacity as its total energy content or theoretical capacity rather than its useful energy content. You need to know this.. 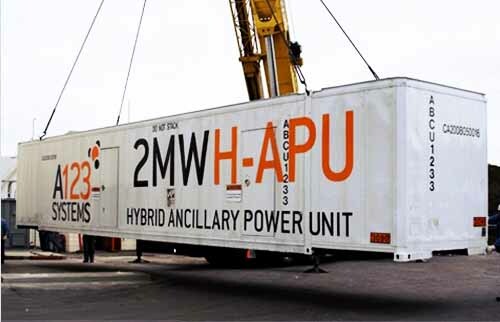 Currently, Lithium ion batteries suitable for grid storage are available from several suppliers in 40 foot containers with various energy storage capacities of around 1 MWH and costing $750,000 or more each. They usually include cooling and an electronic converter unit delivering AC power at 480 Volts 60 Hertz or similar. To store 1 MWH during a charging period of 12 hours, the average charging power must be 1MWH Ã· 12 = 83.33 kW. Similarly the battery must be capable of delivering a power of 83.33 kW during 12 hours of discharge. These charge – discharge rates assume the full plant margin of 25% is being generated and used. Under normal circumstances the actual base load charge – discharge power without the plant margin requirement will be 66.67 kW. However these are the average power deliveries and the peak power availability and demand could vary considerably from the averages. To store 4,400 GWH would need 4.4 million of these 40 foot containers costing $3,300,000,000,000 or $3.3 trillion. As a quick error check on the numbers calculated above, the total power handling capability of 4.4 million containers each supplying a power requirement 66.67 kW will be 4,400,000 X 66.67 kW = 293.3 GW, matching the requirement outlined in the Demand Profile above. For 4.4 million containers, the containers would cover an area of 130.8 million m2 = 130.8 km2 or a square with sides 11.44 km long; but adequate access space must also be provided, adding substantially to the total. Note: If the manufacturer”s specified 1 MWH battery capacity is the installed capacity rather than the usable capacity considered here, one third more, or a total of 5.7 million containerized batteries would be required to store the required 4,400 GWH of energy. In warm climates, extra battery capacity (and consequent solar generating capacity needed to provide it) will be required to power forced cooling of the battery to slow its ageing process and thus avoid its premature failure. All batteries suffer deterioration with age and their end of life is generally specified as being when the capacity has reduced to 80% of what it was when it was new. For lithium batteries the lifetime is typically between eight and ten years but depends on the usage conditions. Higher temperatures accelerate battery ageing and thus reduce battery life. The biggest problem however comes from the finite life of the battery, since the entire installation will have to be replaced every 8 to 10 years. Unlike the situation with lead acid batteries, there are currently very few recycling plants able to recycle Lithium batteries to extract the useful chemicals. In any case, taking a Lithium Cobalt cell as an example, the Lithium content in the LiCoO2 cathode material is only 7% by weight. Lithium is between 20 and 100 times more abundant in the Earth”s crust in terms of the number of atoms than Lead and Nickel, so that the demand for recycling is less. See Battery Chemistries. Note that if these 44 million containerized batteries were manufactured in China, it would take 587 round trips of twenty days each way on the largest container ships to deliver them to the USA. We must address the concept that has acquired a central role in evaluating our energy future. This is energy return on energy invested, or EROEI. In order to utilize energy, we must exert some energy to secure the source and prepare it for use. In order to burn wood in our fireplace, we (or someone) must chop down a tree, cut it into logs, and split the large logs. To drive our gasoline-powered car, we must expend energy finding the oil, drilling and possibly pumping the oil, then refining and distributing the gasoline. To collect solar energy, we must invest energy to fabricate the solar panels and associated electronics. The result is expressed as a ratio of energy-out:energy-in. Anything less than the break-even ratio of 1:1 means that the source provides no net energy (a drain, in fact), and is not worth pursuing for energy purposesâunless the form/convenience of that specific energy is otherwise unavailable. To round out the introduction, coal typically has an EROEI around 50â85:1, and natural gas tends to come in around 20â40:1, though falling below the lower end of this range as the easy fields are depleted. Meanwhile, solar photovoltaics are estimated to require 3â4 yearsâ worth of energy output to fabricate, including the frames and associated electronics systems. Assuming a 30â40 year lifetime, this translates into an EROEI around 10:1. This does not include batteries and/or other storage components. Additional contributions by Tom Tamarkin.